Today beneficiary parents receive a pay rise of $25 weekly or $1,300 yearly. It is impossible without asking an OIA question to know exactly what that means in terms of percentage rise. That's because even though basic rates are known and constant, all the add-ons vary individually. An average sole parent with two children under thirteen, living in South Auckland would receive around $642 on benefit, including accommodation supplement and a minimal extra allowance for costs. As benefits are inflation proofed (though add-ons aren't) that would increase to $647.95 in the last quarter of 2015. With today's increase she would be receiving $673 a week. The table I am quoting doesn't provide gender breakdown with age but female rates are overall consistently lower than male. 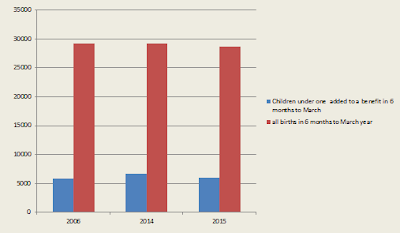 So, all in all, for a young sole mother - particularly Maori or Pacific - $673 is looking fairly attractive. Yes, the work-testing has been extended to part-time (20 hours) for mothers with youngest child aged 3. But the work obligations are only ever useful in places where there are jobs. It'll be interesting to observe the behavioural changes over the coming 2-3 years. Remember that the early work-testing policy implemented to stop people adding children to an existing benefit has already failed. There probably are as many persons coerced into acting, not as they want, but as others want, through majority rule as through totalitarian dictatorship. 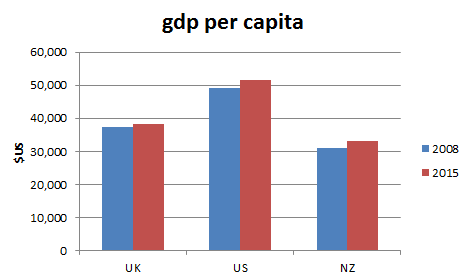 "New Zealand’s growth per person is significantly lower than countries like the UK and America, showing our economy is driven by population growth rather than productivity, says Labour’s Finance spokesperson Grant Robertson. “Along with flat per person growth, we have seen a fall in per capita real incomes. This means on average Kiwis are getting poorer. That’s because the key driver is population growth, not new businesses, industries and exports which is what’s needed to boost growth per person." 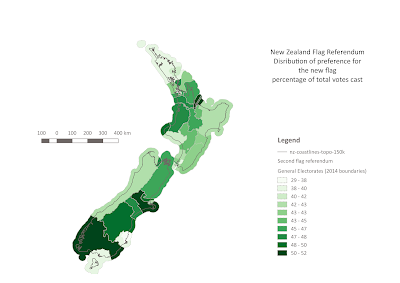 No NZ isn't flash overall but it's comparatively better now than it was when Labour left office. Robertson even included Japan in his headline yet their growth was lower than the UK or US between 2008 and 2014. Idly reading an article I was captured by the photo. What city is that a photo from, I wondered? I can see 3 or 4 Asian looking people, maybe a Philippine, 2 or 3 Caucasian people, a tall black man, someone who looks slightly eastern European or even middle eastern. It just intrigued me because I can only partly see the trains logo. Then I checked the source - the Fraser Institute. So Canada. I googled Canadian Subway logos and found this. Toronto. Without the source clues I never would have guessed. Globalisation. It's a wonderful thing. Crowded subway trains are not. Another graph from David. I don't know enough off the top of my head to see the pattern but he says the pro-change vote aligns to National seats, particularly in the South Island. Also the strong no-change vote in Winston country. Obviously the Maori seats are excluded in this picture. They all voted strongly for the status quo (but with low turn-out).